You can use the icon to share your favorite music in your social network profile, blog, or website. In social networks, you can only post links to tracks, albums, or playlists. 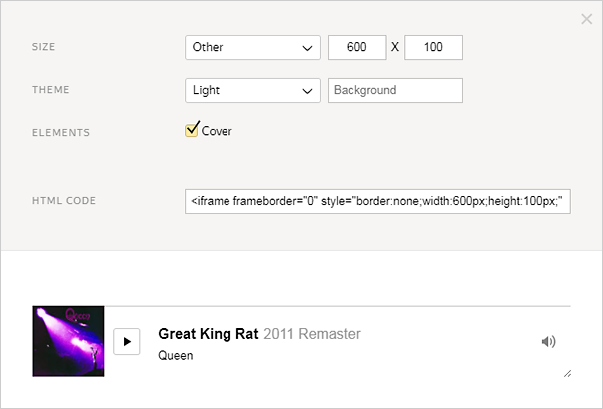 On a blog or site, you can also embed a player to listen to tracks without switching over to Yandex Music. Note. To share a playlist, first you must grant access to it. Click HTML code. A field with the code and a button to configure the player appearance will appear below. If you want to embed a player with the default appearance, just copy the code from the field. If you want to change the size, color, or appearance of the player, click . In the dialog box that opens, change your settings and copy the HTML code. Use the color code to choose a background. Insert the code into your blog or website.